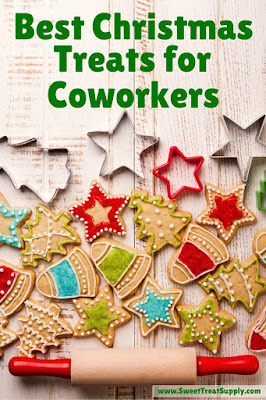 Yummy treats make the ideal Christmas gifts for coworkers, giving them something tasty to snack on at the desk as they work. Chocolate marshmallow pops and cinnamon sugar pecans tickle the taste buds and provide that extra sugar rush to get through the workday. Though sweet treats can perk up even the most disgruntled worker, everyone will need to use their hands to enjoy their snacks. Therefore, you'll want to make treats that keep their fingers clear and clean while working at the keyboard. Candy canes and chocolate – what could be more appropriate for the holiday? With this recipe from the Liv Life blog, you'll surprise everyone in the workplace with something sweet and tasty for Christmas. You can also switch up the dark chocolate for white or Dutch milk chocolate from our online store, and make your own tasty version of this holiday treat. You can enjoy a cookie any day of the week, and Christmas is no exception. After all, if Santa Claus enjoys this tasty treat, your coworkers will also love them. Make the cookies using a typical chocolate chip cookie recipe, but add some crushed peppermint to the mixture. You can also use metal cookie cutters in the shape of angels, bells and candy canes to capture that festive spirit. The cinnamon sugar pecan recipe on the Fresh Dreamer blog has the right idea for delicious treats. With an egg, some vanilla extract, pecans, sugar and water, you can create a delicious Christmas treat for everyone in the office to share. Everyone will feel the holiday spirit when you bring Christmas-themed donuts into work. With some red and green icing and a few decorating tips, you can apply colorful designs to pre-made donuts from the store. Avoid using edible glitter on the donuts as it can stick to everything and cause a mess. Transform melted chocolate into yummy pops for everyone at the office. With our Christmas ornament molds, you can easily make ornament-shaped pops, each with a special design to commemorate the holiday. Thinking about making your coworkers something sweet for the holidays? Share your ideas with us in the comments below!